The performance of Schmeiser's bigger discs in a more maneuverable compact size. Schmeiser's "Built-To-Take-It medium-duty unit rivals competitor's heavy-duty models! 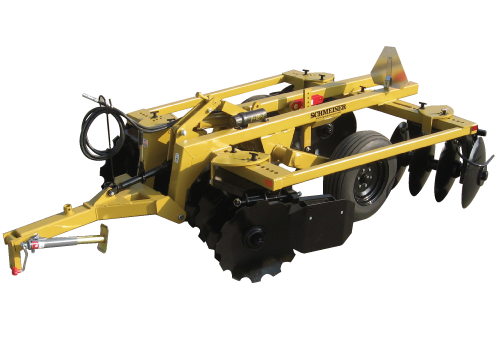 The heavy-duty performer for demanding vineyard conditions, Schmeiser's RTH is built for growers requiring up to a 10' wide cutting width. When you need the versatility of a pull-type middle weight tandem vineyard disc, the Schmeiser PTM with up to a 10' cutting width is your solution. The Schmeiser pull-type heavy-weight tanndem vineyard disc combines strength, size and pull-type versatility to meet your most challenging demands up to a 10' wide cutting width. Built to last, the new super heavy-duty "Schmeiser Orchard Special" tandem disc delivers.